Going back 4 years (where did the time go? ), I see I never blogged after seminar about the classes I took. I typically take a notebook class in order to learn & not have too many unfinished pieces following seminar. My first class was with Sharon G (Garmize) who talked about an “Anatomy of A Stitch Guide” including concepts regarding color, texture, scale, and perspective using some pieces students were willing to share. 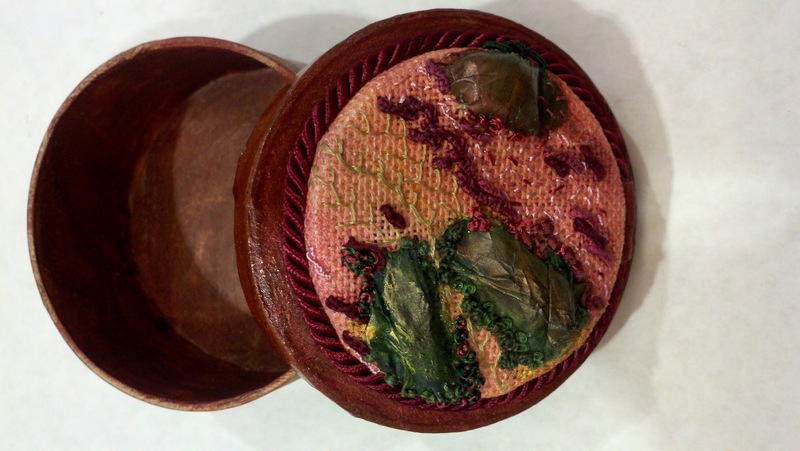 Then, I took a 2-day class with Catherine Jordan for the Ruby Beauty – A Keepsake Box. It was a blast working with paint. We painted the canvas and box. The 3 bumps are pieces of Tyvek that were placed under a hairdryer to shape them that we then cut out to whatever shape we wanted and painted. We stitched it into place & then stitched around it. It was all “finished” by the end of day 2!! 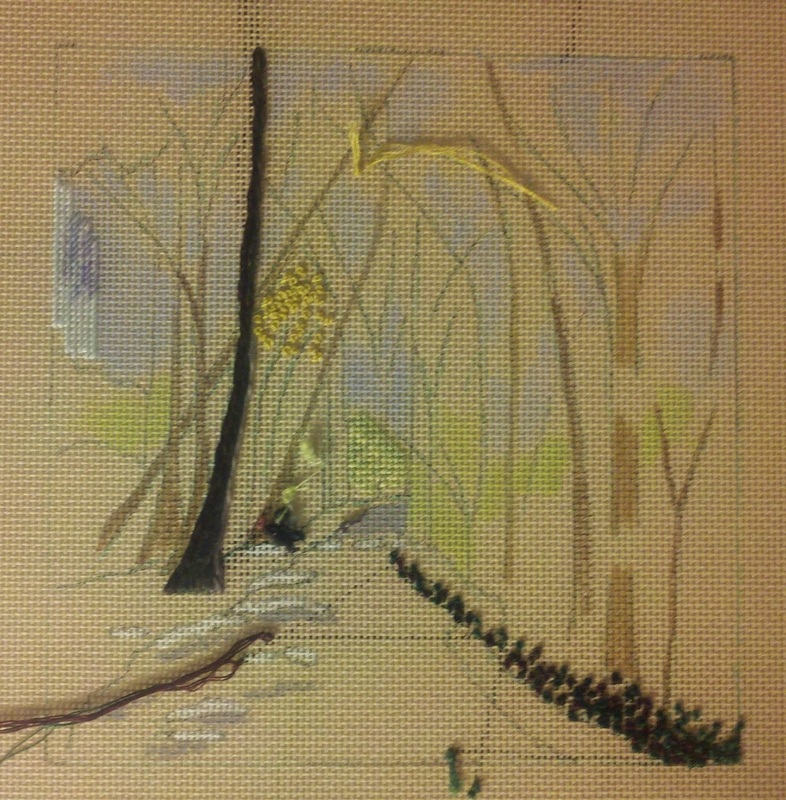 Lastly, “Tar River Trail” which is a landscape piece from Gail Stafford but remains no further since class ended. I thought it was a great class & have meant to get back to it but time has flown by! This is so exciting! I couldn’t say anything until now but I am published! 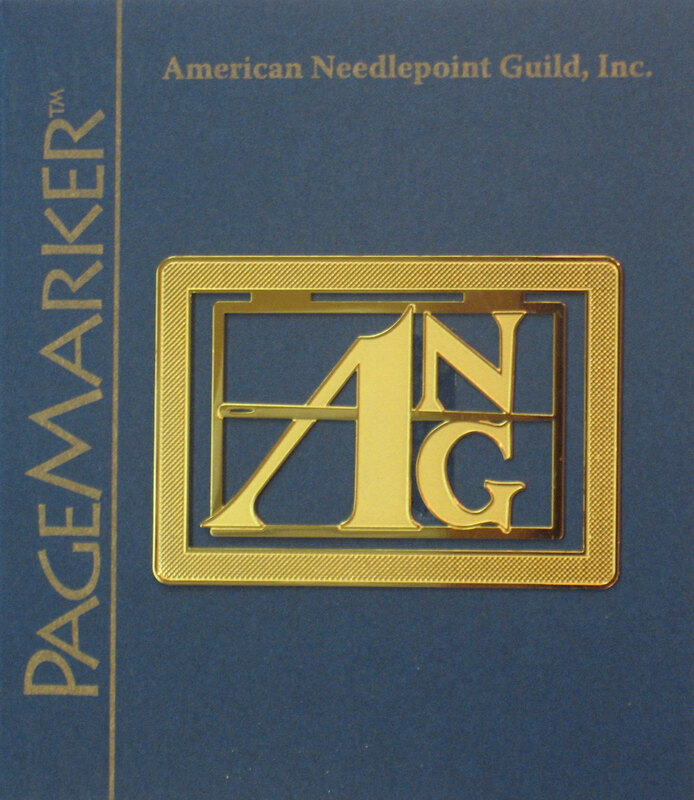 What I didn’t know was that it would be on the cover of Needle Pointers!! I worked with Pam G. who took my hand drawings and turned them into beautiful diagrams. And, she really helped with describing how to execute the stitches from what I had provided. So, I hope you can stitch it without a problem. But, if you do have questions, I’ll be here to help. I just can’t get over how wonderful it turned out. We had an interesting visit to the Philadelphia Museum of Art thanks to the docent that escorted us around to see various tapestries, rugs, and a few samplers. She demonstrated with a wooden loom about warf, weft, and how threads are tied on. Rugs can have 90-250 threads tied per inch. And, I thought making french knots were tedious! I also found out Persian rugs made for kings would be huge – half of one rug (28 feet by 56 feet) was on display. And, there would be two rugs along each long side that would be used exclusively by servants as they ran up and down them – thus, were called runners. Then, we went to the Fabric Workshop and Museum where we were taken upstairs to the workroom. They brought out several examples of past projects – very interesting. The one I was quite taken with was a knitted suit made from multicolored monofilaments (http://www.fabricworkshopandmuseum.org/Exhibitions/ExhibitionDetail.aspx?ExhibitionId=3f7286f4-1702-475e-9ee1-ace1abfc1b51). The form-fitting knitted suit had to be cut along the side to remove the sculpture that had been used to knit around. Then, it was sewed up again and suspended to represent his feeling of dislocation from his homeland. 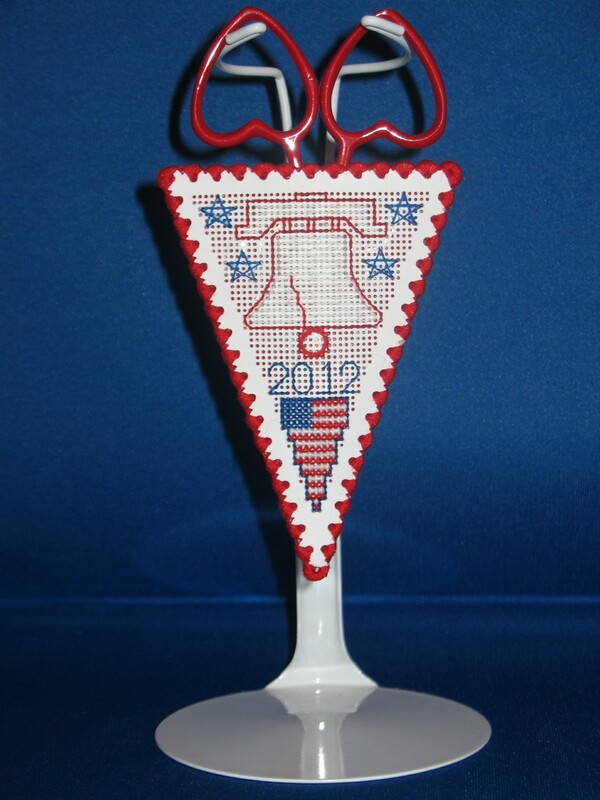 I am very pleased to say that this won a 2nd place ribbon in the Original Design category. I didn’t ask for a critique for this piece but every entry is given a numerical report (no charge beyond your entry fee). I got 24 out of 25 for design characteristics, 23 of 25 for color, 19 of 20 for workmanship/technique, 19 of 20 for suitability, and 10 of 10 for finishing. I am particularly thrilled with the finishing score. I did it myself. 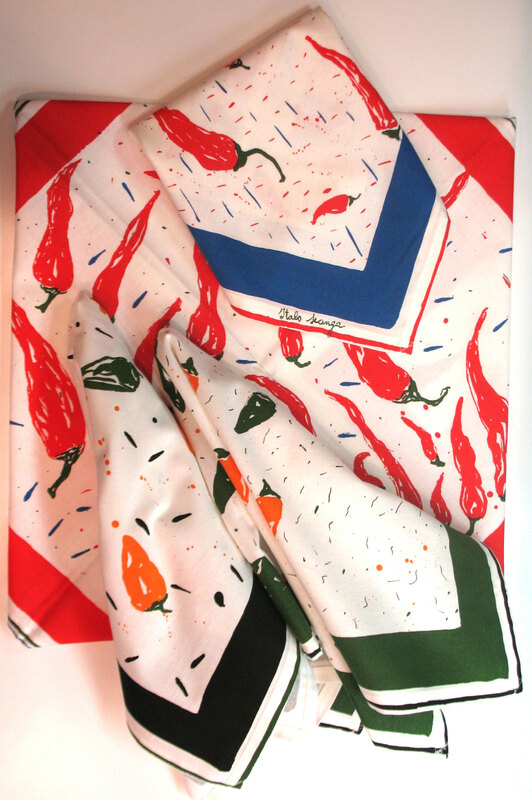 It is lined with a pretty red print. And, I sewed the lining into the edging which was something I had not done on my first scissors sheath band sampler from our chapter project (https://melitastitches4fun.wordpress.com/category/ang-main-line-stitchers-chapter/scissors-sheath-band-sampler/). The red heart-shaped scissors was a great find as was the display stand (intended for a doll). Here’s my artist statement for ‘Celebrate Love’. With ANG’s 40th Anniversary Coming to Philadelphia in 2012, I decided to donate something unique to the auction. However, I fell in love with the scissor sheath & wanted it as my commemorative remembrance of the Seminar. So, I donated something else that I designed. Then, I decided to enter this scissor sheath in the Original Category after realizing that it qualified for “Small Masterpiece” AND “President’s Choice Award”! And, what inspired this piece? 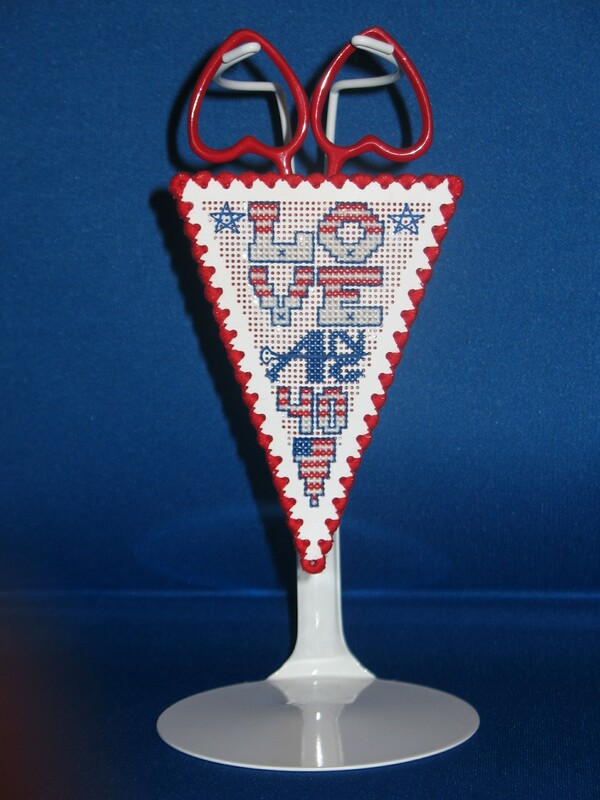 The love of Philadelphia, ANG, and needlepoint! Obviously, the design had to include the ANG logo, 40, and 2012. Every day I walk through LOVE Park (& see the LOVE sculpture) on my way to work in the City of Brotherly Love, Philadelphia. And, nothing says Philadelphia more than the Liberty Bell. So, with what little space I had left, I managed to fit in the American Flag and a few stars. Welcome greetings are sent out to all ANG members as you join me ‘Today’ in Philadelphia to celebrate our love of needlepoint from all of the ‘Yesterdays’ and as we look forward to all of the ‘Tomorrows’. 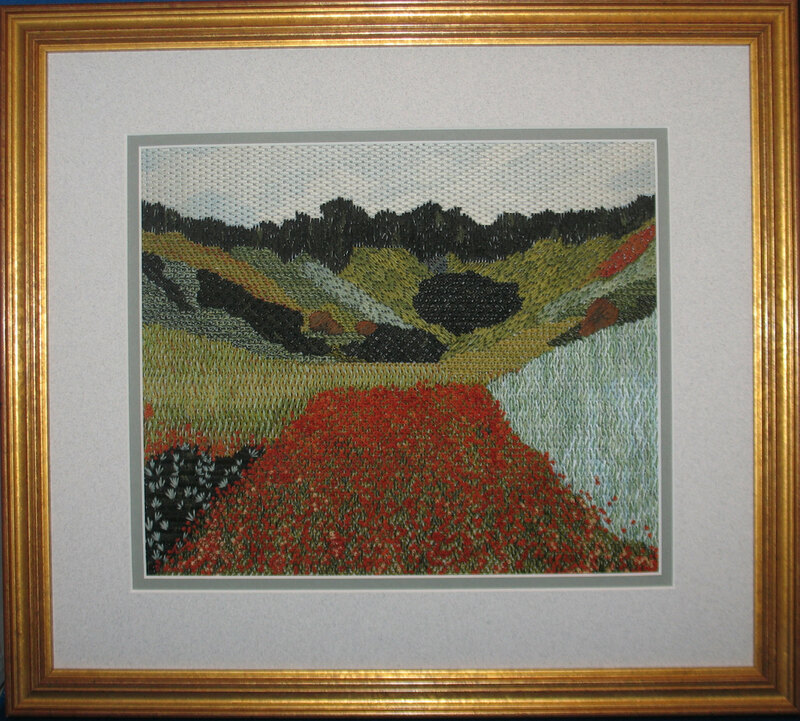 “An Adventure into a Poppy Field” was entered in 2012’s ANG 40th Seminar in the Adaptation category and it won the State Art Award Ribbon. There were about 2 dozen pieces from Pennsylvania. I was shocked and thrilled! I didn’t even know that “State Art Award” was ribbon category. I am glad I am not a judge – too many beautiful pieces to choose from. For this piece, the critique noted that “my journey was well documented”. So true, it is easier because I blog and keep notes. The documents and photos that I sent for the artist’s statement were taken from a previous blog (https://melitastitches4fun.wordpress.com/2011/02/18/an-adventure-into-a-poppy-field/). I still twist the thread (a comment I got last year too) in some sections particularly in the sky on top dark area. So, I will keep working on that. And, the perspective a bit off. I had told friends that one comment I expected was that I had gotten carried away on the poppy field. It got away from me like wild flowers. Better “integration” of stitching to create the hillside was also recommended. I also got nice comments such as “truly lovely”. I would like to thank all the judges for taking time to write the critiques. As was last year’s, they are thoughtful, instructive, and encouraging! I highly recommend getting them done so that you can learn and grow. And, I just love the double mat especially the grayish blue inner mat that was suggested by Ted (Theodore) Hartz, Custom Picture Framing, in West Chester (google will get his name and address – or call Fireside Stitchery who referred me to him). I am very happy with the piece but will the 5th try be my last attempt? Even my husband is ready for a change in design! For now, perhaps I can photograph, enlarge, and project certain areas using the critique as a teaching tool to my local chapter. I bought a book at Ruth Kern’s bookstore (only 1 of 3 – I thought I did good to limit myself to 3) regarding photography. And, several other projects have been put aside with all this seminar activity. So, for now, I look forward the next adventure . . . 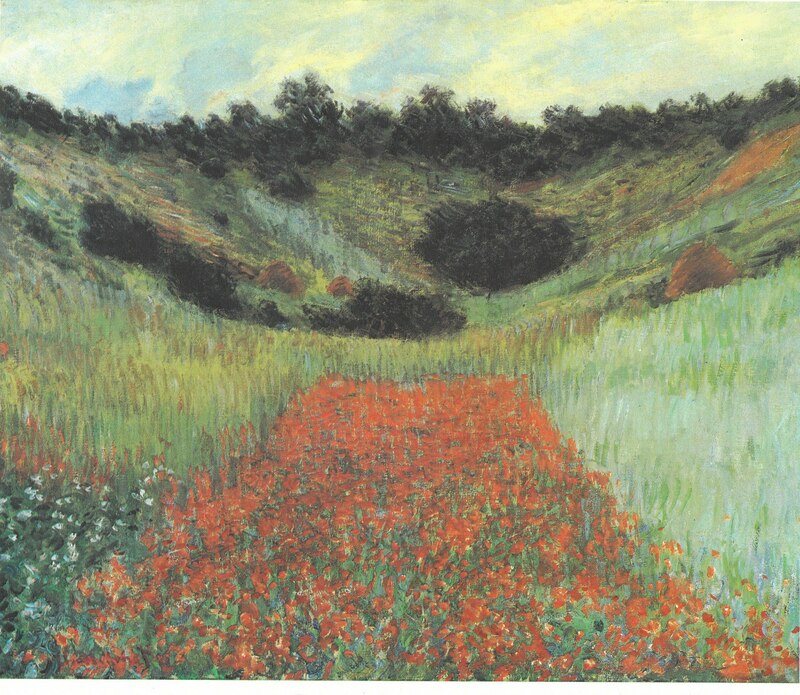 I can’t remember where or when I fell in love with Monet’s Poppy Field in a Hollow near Giverny (1885) but, I want to capture it in needlepoint. It seems so peaceful and relaxing. My first attempt was all about testing stitches. I really like the Whipped or Laced Running Stitch (Elegant Stitches by Judith Baker Montano) for the light blue on the right. I didn’t care for it as much for the 2 greens to the left of that area. I also liked the stitch Serendipity used in the top blue-green portion for the distant tree line and Rococo for the dark green bushes in the middle (both are from Stitches To Go by Suzanne Howren & Beth Robertson). It’s size is 4&1/2″ x 4&1/2″ and too square. The quest continued for stitches in my second attempt. I had it in my mind that a large stitch pattern base would work for the poppies and then thought random french and colonial knots would make the flowers on the field appear random but it became too dense. I did like the Knotted Stitch on the upper left and a similar stitch with less slope for the area to the left of the center dark green bushes called Diagonal Roumanian. Then, I created a variation of Kennan for the area left of the center dark green bushes. These stitches came from Stitches To Go by Suzanne Howren & Beth Robertson. I expanded the size to 4″ x 4&1/2″. I felt pretty good about stitches and decided in the third attempt that I better test some colors and threads. To combat the density of the poppy field, I switched to a thinner thread. It was better but it wasn’t right – it seemed flat and lifeless. So, I put it away for a long time deciding further experience was needed before I could improve the piece. Always on the lookout for new threads, I tried a variety of threads for my fourth attempt. I also tried some different stitches. I liked this version much better, especially the poppy field because I used various shades. While I saw improvement, I wasn’t sure where to go next and decided to put it away – again. Then, I saw the class ‘Landscapes’ was teaching design and stitching techniques just for landscapes at the 2010 ANG Seminar taught by Lois Kershner. So, I attended my first seminar to help me figure out how to do my poppy field. I left Ohio armed with knowledge from her class as taught by Pat Rusch. Working now on a full scale size (8″ x 9&1/2″), I studied the techniques in the book and reconsidered threads and stitches – again! I hope the patches of the long grass will be as inviting as Monet’s and you and I enter into the field, sit, and relax for a while until another adventure comes along. 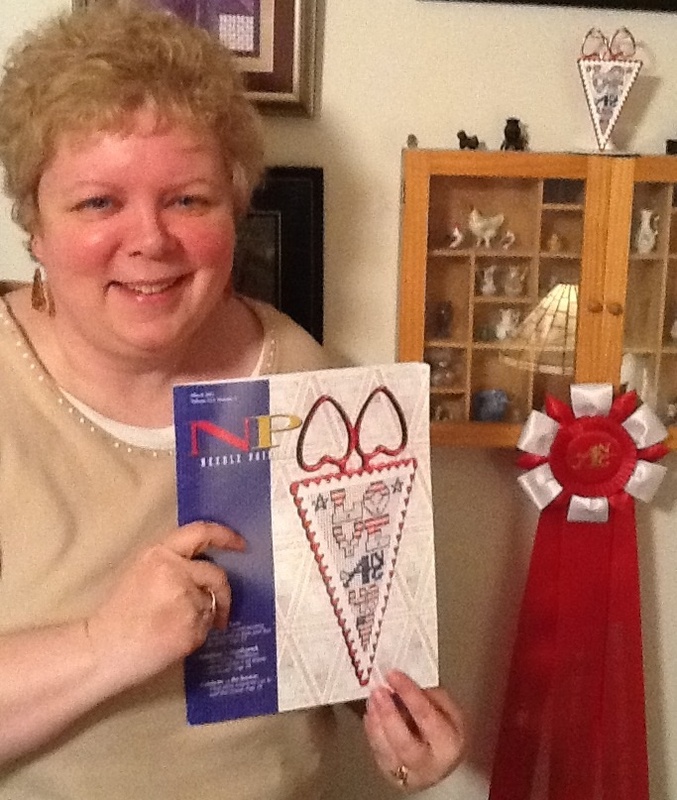 I met 2 of the ladies from the chapter that stitched the ribbons & now can’t remember their names or chapter. I found their names/chapter in the seminar brochure. So, thanks to the ladies in the Cape Cod Chapter and Keystone Chapter. I discovered that our state flower is the Mountain Laurel! It is a lovely ribbon. 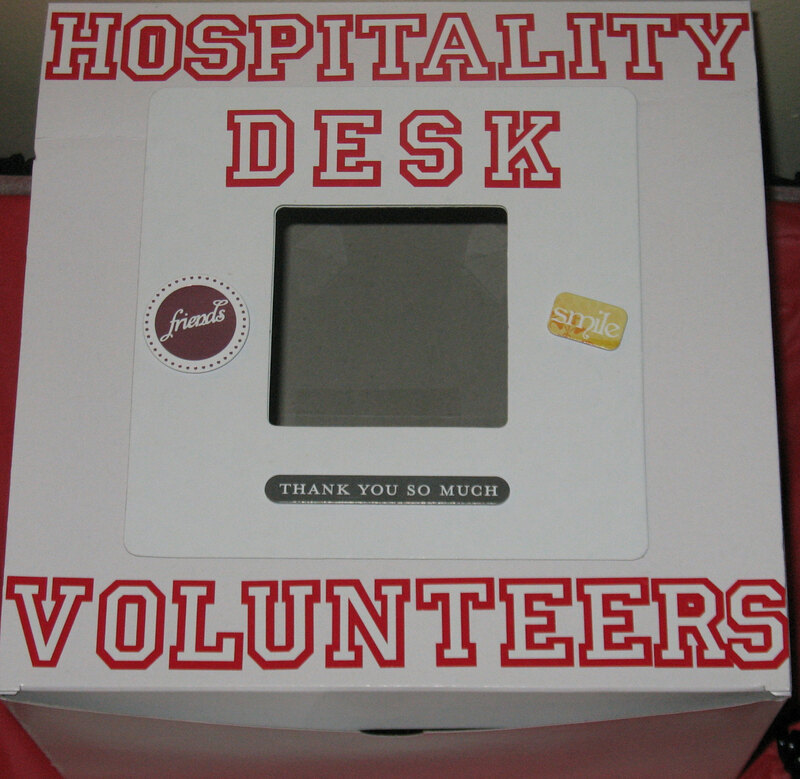 I had about 40 wonderful folks contributing their time to volunteer at the Hospitality Desk. And, to thank them, I made a stitched commemorative gift. Since I couldn’t stitch one for everyone, I had a daily drawing. For every hour worked, they put a slip in the box. The more worked, the more chances! I divulged pictures of each gift daily during seminar! 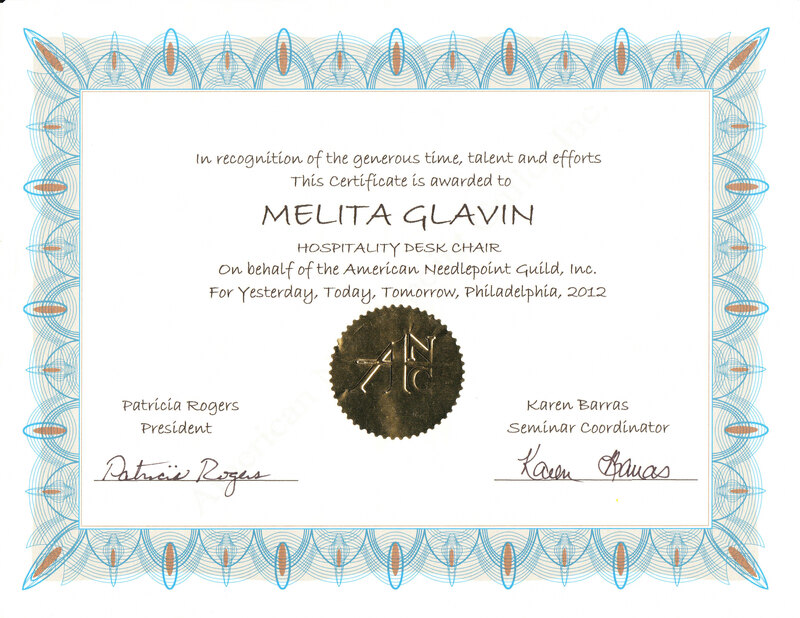 I want to thank ANG for the certificate and bookmark that I was given for my efforts! That was a nice surprise & useful. The whole week really was a success because of everyone. Even my husband, Bill, helped me! He drew names a few days & wrote out the lists of winners (he has better handwriting than I). He loved the ANG pens that were handed out at the opening banquet so I gave him mine. Funny story: We do not usually kiss in public & I don’t know what possessed me but after I kissed him goodbye on the elevator when he was off to dinner with Tony on the night of the closing banquet, he got kisses from all the ladies on the elevator!! What a fun group of women! It is such an amazing amount of work to put on a seminar such as this and as this was only my second I really appreciated everyone contributing. I showed up at 8 am to check on things before class, popped in at least once during the day, and came back at 5 pm for drawings. So, I don’t think I met everyone but many of you I did meet. I worked a couple of shifts but really got to enjoy my classes! In fact, I even finished one and is the subject of an upcoming blog. A special thanks goes out to Lynn who enjoyed the seminar as well. 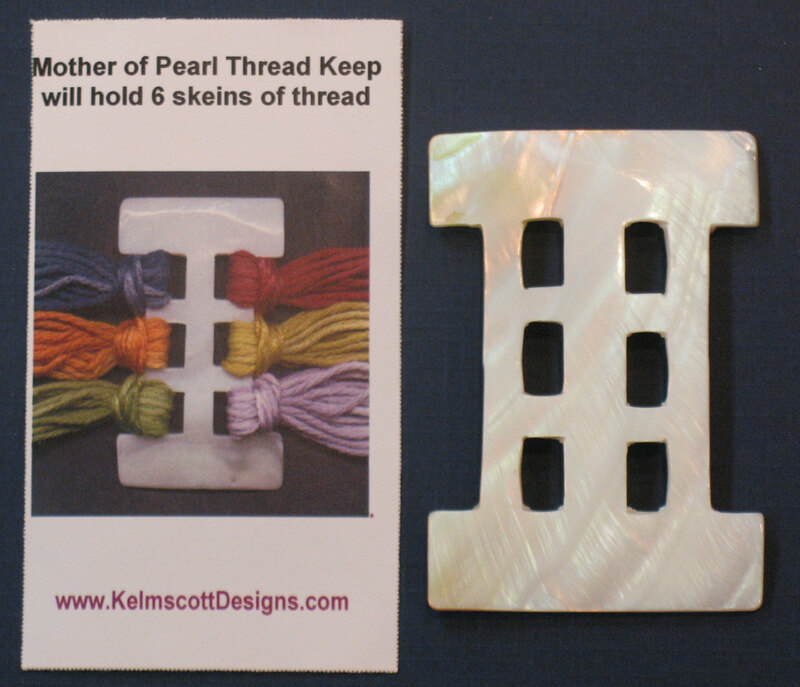 She gave me this lovely Mother of Pearl ‘Thread Keep’ for my efforts before & during seminar. I will use it often and remember all of you and what a wonderful 40th seminar we had in my home city of Philadelphia! And, last but not least, many folks stopped me to say they enjoyed reading my blog & I appreciate that as well. 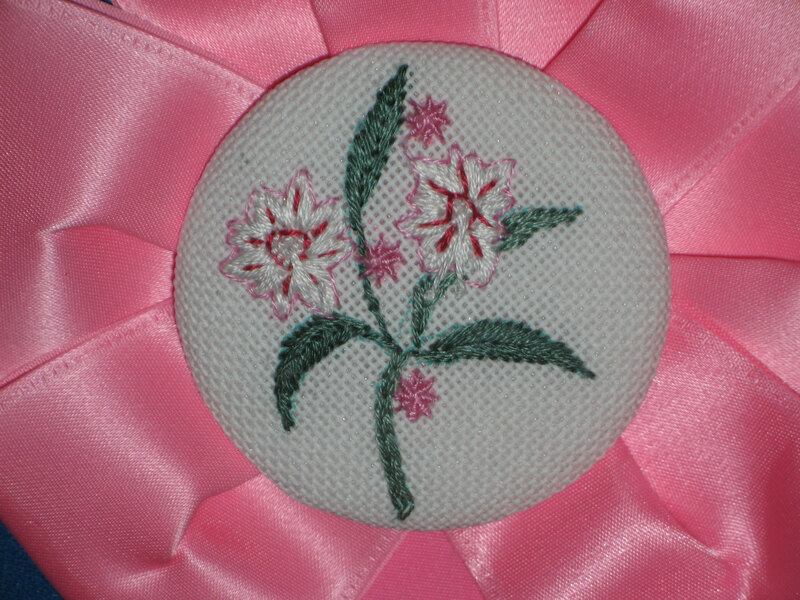 It is a wonderful medium to share my needlepoint and am glad anyone takes the time to visit! !